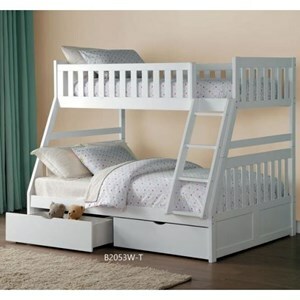 Whether you have children who share a room or you are looking for a fun, youthful style, this twin over full bunk bed will make a great addition to your home. The solid pine construction offers durability, while full length guard rails provide safety and a built-in ladder allows for easy access to the top twin bunk. The relaxed features will blend perfectly with any casual decor and will create a refreshing look in your children's bedroom. 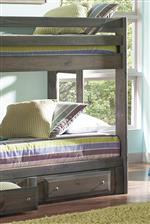 The Wrangle Hill Twin Over Full Bunk Bed with Built-In Ladder by Coaster at Beck's Furniture in the Sacramento, Rancho Cordova, Roseville, California area. Product availability may vary. Contact us for the most current availability on this product. 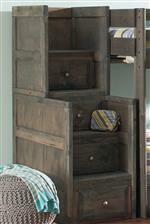 400830B2 Twin Over Full Bunk Bed Box 2 1 0" 0" 0"
400830B1 Twin Over Full Bunk Bed Box 1 1 0" 0" 0"